There are currently 34,803 users on this website. Has anyone ever seen one of these? After googling I've seen a couple online but they all look cancelled. Is this still redeemable or is it worth more as a collectible? Any information would be greatly appreciated! I have no clue but I see it has a stipulation "in the event of the reunification of Germany" very cool historically speaking! Assuming it is still redeemable, the value would be negligible. The certificate represents interest due from December 1944 to November 1952 on a 1000 franc bond. That would have been 1000 old francs which was revalued at 100 old francs to 1 new franc in 1960. At 3% this represents 2.4 new francs which accrued interest at a rate of 4% or 1 new centime per year which would get you 3.07 new francs including the original interest amount and the accumulated interest a 4% since 1952. The franc to euro conversion was about 6.56 francs to a euro so it would represent about a half euro worth of accumulated interest through 2019. In about 2008 or so the German government sold off its holdings of bonds that had been redeemed including pre-war bonds and post-war certificates. Most of those were punch canceled. This certificate does not appear to be punch canceled but I have seen other items from this hoard that were also not canceled although they had been redeemed. The restructuring of Germany's pre-war debt from the 1930s through unification is a fascinating study. In the 1930s the German Finance Ministry (which was made up mostly of career finance executives who fiercely sought to maintain the Reichsbank's independence from political influence) came up with a clever scheme to deal with the pre-war debt. After the currency collapse of 1923, foreign investors insisted that German debt instruments be denominated in their country's currency which is why the original bond represented by this certificate was denominated in French francs. In 1932 the German finance ministry instituted a number of currency regulations to deal with the depression. One of those was to make the RM inconvertible. It also prohibited RM and foreign exchange from leaving Germany. It then created the Conversion Office for Foreign Debt (Konversionskasse fur Deutsche Ausslandschulden). The Conversion Office required the interest payments for foreign debt to be paid to it and then issued part payment in foreign exchange and part payment in scrip issued by the Conversion Office. The scrip ended up valueless and the price in the open market for German foreign bonds plummeted. The Germans then bought up their own bonds at a discount and retired them. The bondholders were furious and protested until 1939 when other events got in the way. Nevertheless, the Germans continued to make interest payments until 1944 which is why this certificate represents interest from December 1944. The Allied Military Government put a temporary halt on payments on pre-war German debts until the London Conference of 1952 established a mechanism for re-funding that debt. The London Agreement required the West German government to issue new bonds to replace the face amount of the old ones and certificates like this one were issued to represent the interest that accrued from 1944 when the Allied Military Government halted payments to the implementation of the London Agreement in 1952. There was a deadline for bondholders to turn in their old bonds for new ones. Prior to doing so, the Validation Board for German Foreign Debts had to approve a bondholder's claim. This was necessary because the Russians looted the Reichsbank when they arrived in Berlin in 1945 and the already redeemed bonds were unaccounted for. The West German government was not interested in redeeming again bonds that already been redeemed. Many of the pre-war bonds from the Conversion Office that are in the collecting marketplace were bonds that were looted by the Russians. After reunification the Bundesbank discovered that the East German government had the records of redemption and had kept the thousands of pre-war redeemed bonds and other certificates. It was this hoard that was sold by the Bundesbank. 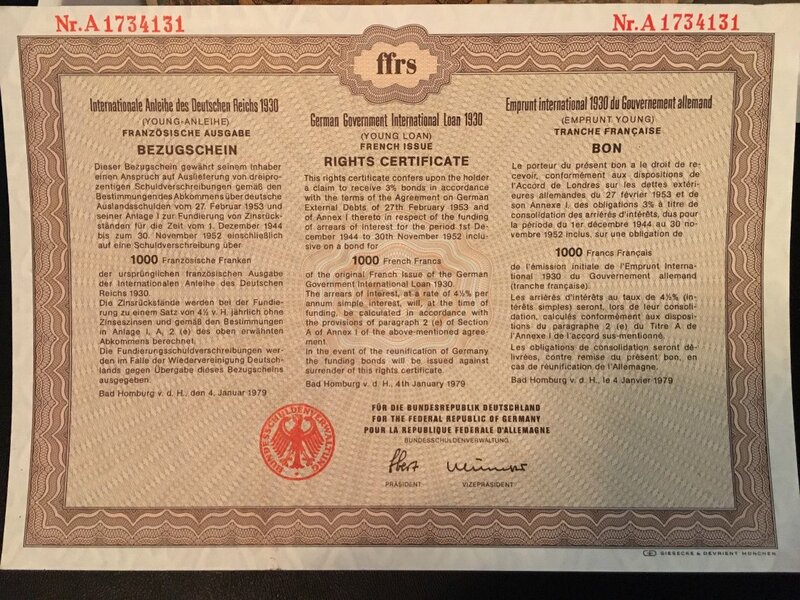 The $1,000.00 5% bond Gregalex has in the post on non-US bonds is an example of the post 1952 West German bond that replaced a pre-war $1,000.00 bond from the US Young Loan. Missing from his bond are the interest coupons and a Talon. The Talon indicated that it represented the accrued interest from 1944 to 1952 and was redeemable after unification. Thank you Lettow for the great information!! Lettow answered that far better than I ever could! 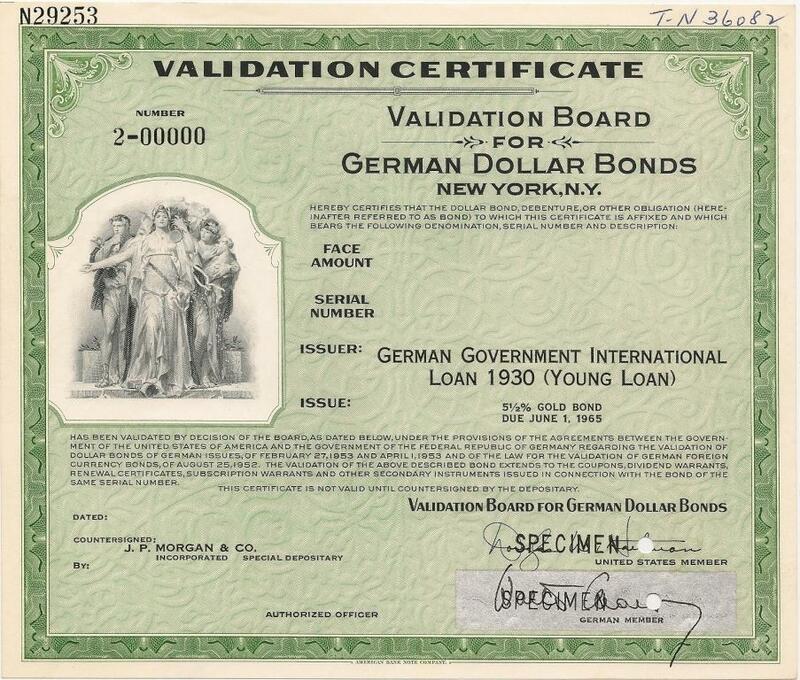 This is a specimen of the validation certificate that was applied to bonds from the US Young Loan. Only those that were validated could be exchanged for the bond GregAlex showed. These specimens came out from the ABNC archive sales. Issued examples are scarce as they were turned in with the original bond when exchanged. I agree! That's the first one I've seen.